In last two articles Database Development with Visual Studio 2010: Overview of SQL Server Data-Tier Application (DACPAC) and Database Development with Visual Studio 2010: Database Projects and Database Server Projects we discussed how to work with DAC applications and an overview of Database Projects/ Server Projects with Visual Studio 2010. In this article, we will see how to create database project, add database objects schema to it and how to build and later deploy database to the server. We will create a database unit test for stored procedure and finally add the project to source control. 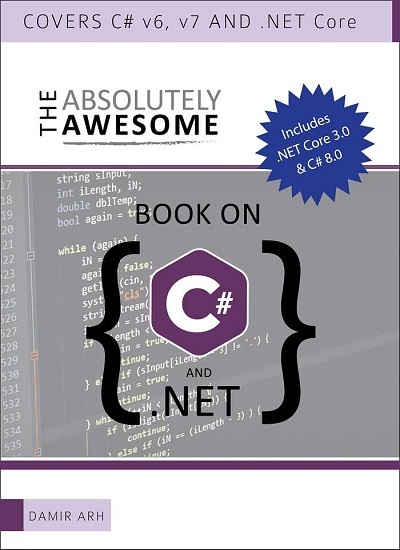 With Visual Studio 2010 you can manage the complete life cycle of the databases (since it is a part of application development), by using various project types like Database/ Server projects or DAC applications. Various team members can work on the schema objects at the same time without deploying them on production server. Visual Studio 2010 helps to do the changes to the database, provides permissions for SQL server. 1. You can run database unit tests but cannot create new tests or modify. 2. You can generate data only as part of existing database unit tests. 3. Schema and data comparison are not available. 4. Database refactoring and Code Analysis cannot be used. In this article, we will discuss how to create an empty database project, add table, index, stored procedure to it, provide build and deployment features, deploy it, add to source control and also how to write database unit test. Step 2 : Enter name DemoDB, specify location, clear check box for ‘Add to Source Control’. Step 12 : Now that various database objects are added, we will build and deploy the application. Right click on the project name in Solution Explorer and select Properties. Select Deploy tab and change Deployment action to `Create a deployment script (.sql) and deploy to database’. Provide the target connection by clicking on Edit. 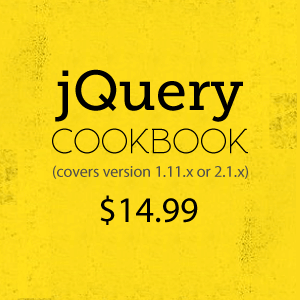 Step 14 : Let us write database unit tests now. We will have to provide the connection from which test data can be taken. I have used 2 tables namely TestTrainers and TestTrainings for this purpose. Let us create test data for these tables by using test generation plan. I created these 2 new tables by using SQL Server 2008 R2 SQL Server Management Studio and kept the same structure and in the same schema. Step 15 : Now I have two extra tables in database but they are not in the current database project. I used Schema Compare – New Schema Comparison, source as database and target as the current project name. The schema comparison pointed out the 2 new tables and provided me way to add it to the database by Write updates. Now you can use data generation plan to generate data for test tables. For data generation you can apply some conditions like TrainerName must be with alphabets, Days can be between 1 and 5 etc. To apply these rules select the field and use properties. 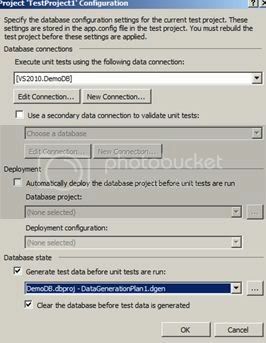 Step 17 : You can use the data generation plan when creating database unit test. Step 19 : After the execution of the test, we can see 50 records added to the table Trainers. Similarly you can add database unit test for the other table and do the modifications to the code provided. Step 20 : Now the last step is to add this solution to source control. From Solution Explorer, right click on the project name and select `Add solution to Source Control’. Specify the Team Project under which you need to add this database project. The different versions of the database projects can be kept in source control and deploy any one of them when required. In this article, we discussed various components of Database Projects when we started with an empty database project. We added different database objects like tables, indexes, keys, stored procedures. We deployed the database to SQL Server 2008 R2. We saw how schema comparison can be used to get the changes in the current schema and apply it to the database project. We discussed how database unit test can be added and also execute it. Finally we added the database project to the source control. I could not create DataBase project in vs.net 2010 premium edition. I have error message says Microsoft.SqlServer.Management.SqlParser.dll is not found. I have installed sql server 2008 as well. How do you create a new schema and have all the folders underneath it show up? 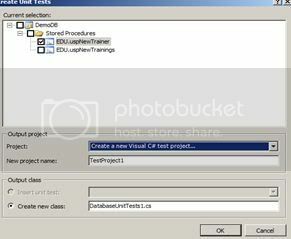 I have created database project with using VS 2010. i have created two database test1 and test2 with same schema. when i change test1 schema and deploy project. all are running successfull. when i checked test2 database, test 1 schema updates are not populated to test2. what is problem? Please help to me, to resolve this issue. This tutorial is terribly rushed with far too much copy and paste and very little how and why. "Only one statement is allowed per batch. A batch separator, such as 'GO', might be required between statements. 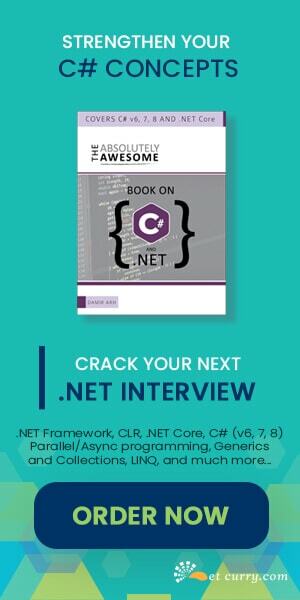 I am using VB.net 2010.but when i used database, I can't creat setup file. Can you elaborate on your problem?